The Executive Stand Steady Standing Desk Converter is affordable, comfortable, professional, and compatible with your existing desk. Simply place The Stand Steady height adjustable sit stand desk converter on top of your any desk or tabletop, set it to your preferred height, and you have instantly converted your work space into an affordable, effective stand up desk. This large-sized adjustable desk riser is spacious enough to hold two monitors, or a monitor and a laptop. Better yet, it actually increases your usable desktop space by more than four-and-a-half square feet because you can stash items below (such as a small printer, files, or knick-knacks). 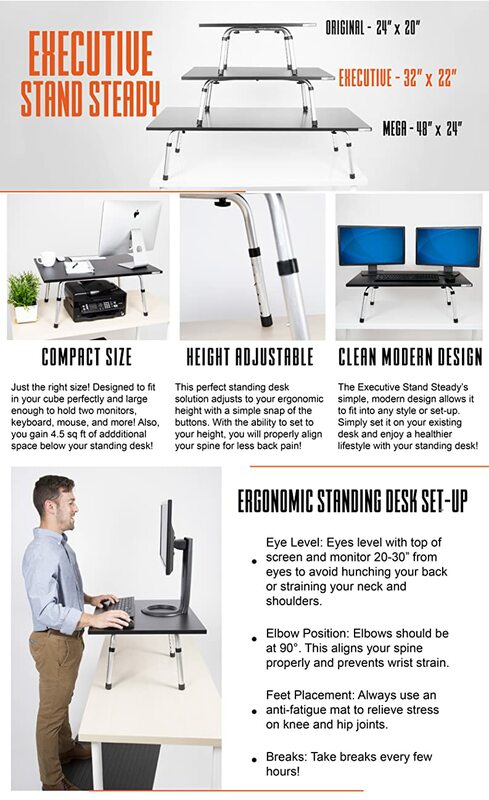 The Stand Steady adjustable standing desk converter is the quickest, easiest, and most cost effective way to stand up for your health and productivity...and the perfect choice for dual screens! LARGE ERGONOMIC SURFACE: Measuring 32" x 22” (approximately 4.5 square feet), the sit stand desk converter can be set at a positive or negative tilt for a more personalized fit and better typing comfort. It’s also large enough to fit your dual monitors, keyboard, mouse, snacks, your collection of bobble heads, and more! We have now included adding these in our Ergonomic package for our remote team. They have found it to be really useful and they love how it is adjustable for different heights even on the desk! It is quite durable as well! The desk shook the entire time I wrote. The portion where the legs adjust wasn’t a tight fit so all four of the legs were moving as I wrote. The price was really high, I figured the materials would be steardy. It was a cheaply built Chinese product that is way overcharged and not functional for writing. We ordered a bunch of these for our remote team! They love them. It is great that all of the legs are adjustable so you can have it flat or tilt. I like the simple design.